Penta Techsoft Solution a leading web design company India offering static website design packages for the smaller businesses, whose products and services of their company not requires any change in the list or data. We develop Static website design that is easy to access, extremely fast, and well to identify the products and services with good html designs. Static web page designs are useful to all types of online businesses to develop their landing pages for marketing purpose. Penta Techsoft Solution Web Design Company develop unique static website to your business with perfect UI Design, search-engine & user-friendly navigation, browser compatible, responsive, and fast loading features. Does your web design looks fresh and professional? The flexibility of the static website is the main advantage. All the pages of the static website are different according to the desires of the customers. 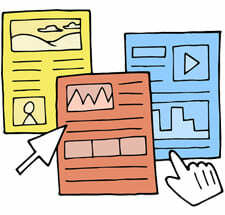 To match the layout of the different pages content is done by the designers Web Design Company for free. They use the special effects on the pages on the customers’ demand in a unique way. There is possible that sometimes the author may demand the different themes on different pages of the book but the designers know that the cover design and the context should be on the same theme to influence and the continuity of the story. The other advantage that helps the small companies to design and create the web presence from Web Design Companies in India is the rates. The development and the hosting rates of the static websites are cheaper as compare to dynamic.